Pain in the shoulder can effect almost every aspect of your life. From stabbing sharp pain with certain movements, aching all over after exercise to nagging pains that wont go away, shoulder pain is a big problem that needs to be fully assessed and treated by a musculoskeletal practitioner. At SoftTissue Solutions we travel the world training and learning to ensure we are at the tip of the spear when it comes to shoulder pain and the latest treatment options. In all cases of shoulder pain, something within the tissues of the shoulder and even sometimes the neck are being overloaded, damaged or inflamed. There are a lot of potential causes underlying pain in the shoulder, it can be a very difficult condition to accurately diagnose. This is why it’s so important to choose a practitioner that has special training in diagnosis and treatment for shoulder pain. Below are just a few of the more common causes of shoulder pain. 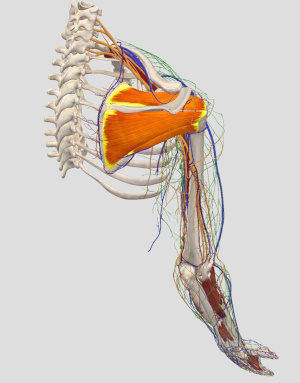 The rotator cuff muscle group are the main control units of the shoulder. They can become damaged in either an acute, high impact injury, or more commonly in a chronic overuse scenario. It’s not hard to imagine how a torn or strained muscle can cause shoulder pain and it is critical that if this is part of your diagnosis, that it is correctly identified. A rotator cuff tendon can become trapped and inflamed under a shoulder bone. Developing gradually through wear and tear, most commonly with repetitive overhead movements. Symptoms include pain across the shoulder, disturbed sleep, weakness, and limited motion. Excess bone growth can also cause impingement of the rotator cuff tendon. The shoulder joint is an extremely manoeuvrable joint. The range of motion it can travel through is quite amazing. But this motion comes at a cost, and the price you pay is stability. The shoulder cartilage function is to improve stability. This is why it is very common to damage the cartilage of the shoulder. Symptoms include pain, clicking or popping, weakness and poor mobility. Bursae are fluid filled sacs that reduce friction of soft tissues gliding over/across each other during movement. A bursa may become irritated and inflamed causing pain. Most commonly from repetitive motion and weak/tight muscles increasing stress the on them. Pain is generally achy at the site of the bursa along with stiffness, and weakness. Generally found with impingement or rotator cuff tears. Adhesion is a type of fibrous scar tissue that can build up in the shoulder muscles, joint capsules, ligament and tendons. When it’s present adhesion acts like glue and can affect the way that the shoulder normally moves. Reduced mobility drastically alters the loads within the joint and between the tissues that control the shoulder. This can lead to pain and weakness. Adhesion can be treated by a musculoskeletal practitioner with special training. Restoring function through the accurate assessment and treatment of your shoulder biomechanics is the most effective way to treat shoulder pain.